PATENTED INVENTION FOR SELL. PUBLISHED DATE: DECEMBER 3, 2015 and September 18, 2018. PATENT NUMBER 10077094. CONTACT INFORMATION: JAMES OR ANNA MCGUIRE, INVENTORS., 512-413-6356. Please leave a message and we will return your call. Thank you. A system for a mooring device is herein disclosed. The mooring device comprises a disc and a collar. The disc comprises a central orifice and one or more holes. The central orifice is mountable to a boat seat post. The holes large enough to accommodate a mooring line to pass through. The collar positionable on an end of the disc. A method for mooring a boat is further disclosed. Specifically, the method comprises mounting a mooring device onto a boat seat post. The mooring device comprises a disc and a collar. The disc comprises a central orifice and one or more holes. The central orifice is mountable to the boat seat post. The holes attachable to a mooring line. Further, the method comprises fastening the collar onto the boat seat post. 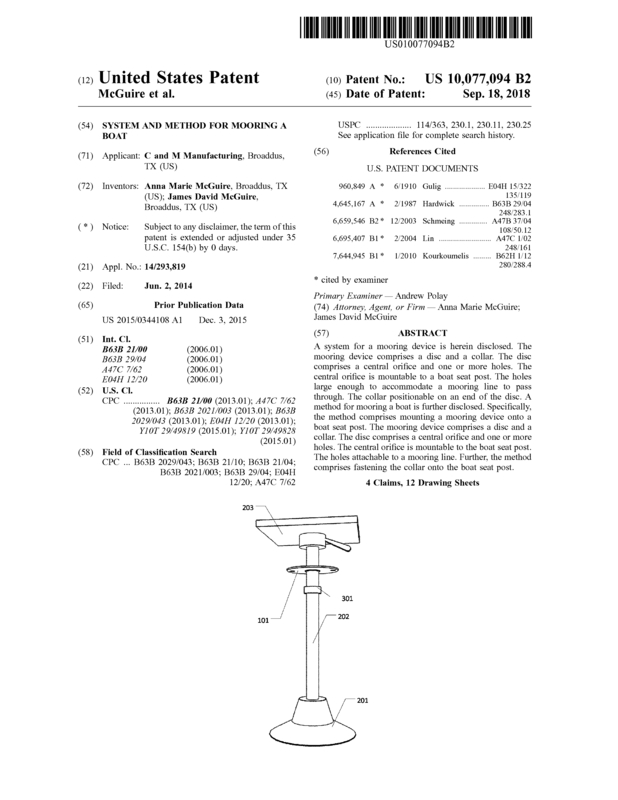 Page created at 2019-04-25 14:02:58, Patent Auction Time.